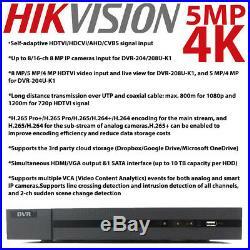 HIKVISION 5MP CCTV SYSTEM UHD 4K DVR 4CH 8CH EXIR 40M NIGHT VISION CAMERA KIT UK. 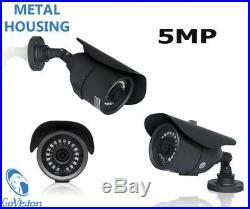 HIKVISION 5MP CCTV SYSTEM UHD 4K DVR 4CH 8CH EXIR 20M NIGHT VISION CAMERA KIT UK. You Can Return A Product For Up To 30 Days. All orders before 1PM will be dispatched Same Day! 1x 4 Ch/8Ch 5MP Hikvision Hiwatch DVR. 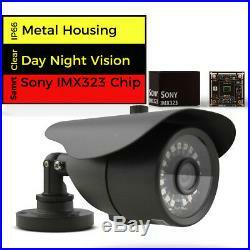 Up to 8x 5MP Waterproof Gray Camera (Govision). 20M (65FT) Pre Made BNC Cables For each camera. Ultra-Clear and Crisp 5MP Recording. View your world like never before with 25601960pixels system. This easy to install DVR boasts 5MP recording capabilities producing outstanding high definition images that bring everything back to life. Get a smartphone, table or computer and get real-time monitoring of your home and office no matter where you are. With the free and easy-to-use app, remote monitoring can be as easy as ABC. 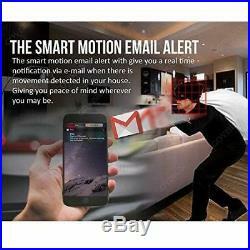 While working with cameras, every unexpected movements that thrown into the cameras eye will be detected and recorded. Full HD VGA and HDMI Outputs. On the back panel of the DVR, we provide HDMI and VGA full HD outputs. Get a TV or HD monitor and stream live video to it. High quality video is guaranteed whether you are playing back or live viewing. Support ONVIF for Third Party. By supporting ONVIF protocol, this DVR is connectable to third party cameras. With this powerful compatibility, you are allowed to take full advantage of your cameras and have full control over them. 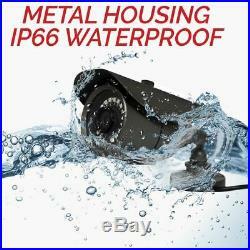 The camera are assembled with IP66 Housing to protect your home or business even in the harshest weather. High tech auto IR-CUT filter reduces the colour cast effect on the image leaving you with great picture quality. Wide angle 3.6mm lens provides you the best clear view up to 20m. 18 LED WITH IR CUT. High tech auto lR-CUT filters reduces the colour cast effect on the image leaving you with great picture quality. Crystal 5MP ULTRA HD video brings your attention to the smallest details. EFFECTIVE PICTURE ELEMENTS: 4K 1960P 5MP. SCANNING SYSTEM: 2:1 INTERLACE. MINIMUM ILLUMINATION: 0.01 LUX (WITH IR LED ON). SYNCHRONOUS SYSTEM: INTERNAL, NEGATIVE SYNC. AUTO ELECTRONIC SHUTTER: NTSC: 1/60S 1/80,000S, PAL: 1/50S 1/80,000S. IR PROJECT DISTANCE : 20 METERS (WITH 18 UNITE LED). IR STATUS: UNDER 10 LUX BY CDS. IR POWER ON: CDS AUTO CONTROL. POWER \ CURRENT : 12VDC (+/-10%) / 380 MA. Analog and HD-TVI video input. Support HDTVI input: 8 MP, 5 MP, 4 MP, 3 MP, 1080p30, 1080p25, 720p60, 720p50, 720p30, 720p25. Support AHD input: 5 MP, 4 MP, 1080p25, 1080p30, 720p25, 720p30 Support CVI input: 4 MP, 1080p25, 1080p30, 720p25, 720p30 Support CVBS input: PAL/NTSC. BNC (1.0 Vp-p, 75). RCA (2.0 Vp-p, 1 k). 1-ch, RCA (2.0 Vp-p, 1 K) (using the 1st channel of audio input). VGA: 1-ch, 1920 × 1080/60Hz, 1280 × 1024/60Hz, 1280 × 720/60Hz, 1024 × 768/60Hz HDMI: 1-ch, 4K (3840 × 2160)/30Hz, 2K (2560 × 1440)/60Hz, 1920 × 1080/60Hz, 1280 × 1024/60Hz, 1280 × 720/60Hz, 1024 × 768/60Hz. 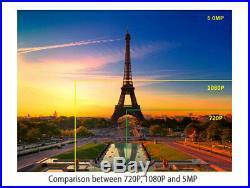 8 MP/5 MP/4 MP/3 MP/1080p/720p/WD1/4CIF/VGA/CIF. TCP/IP, PPPoE, DHCP, Hik-Connect, DNS, DDNS, NTP, SADP, NFS, iSCSI, UPnP? Up to 10 TB capacity for each disk. 1; 10M / 100M / 1000M self-adaptive Ethernet interface. 2 USB 2.0 Interfaces. 10 oC to +55 oC (+14 oF to +131 oF). 315 × 242 × 45 mm (12.4 × 9.5 × 1.8 inch). Your order will be dispatched same day if ordered before 15pm (Monday-Friday) and you should expect to receive it 2-3 days. Any product you return must be in the same condition you received it and in the original packaging. The item "HIKVISION 5MP CCTV SYSTEM UHD 4K DVR 4CH 8CH EXIR 20M NIGHT VISION CAMERA KIT UK" is in sale since Tuesday, July 24, 2018. This item is in the category "Home, Furniture & DIY\Smart Home & Surveillance\Home Surveillance\Home Surveillance Parts & Accessories\Other Surveillance Parts & Accessories". The seller is "avestaukltd" and is located in Salford.